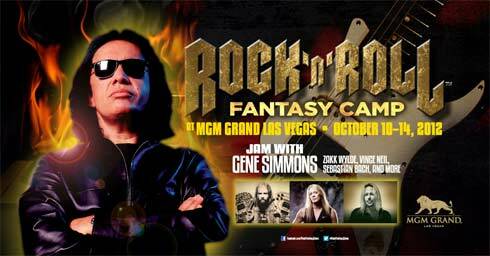 Rock ‘n’ Roll Fantasy Camp announced today that you can become the rock star of your dreams during the next installment of its highly successful music-magic experience is scheduled for April 4 -7 in Las Vegas. Headlining the camp are arena rock legends Def Leppard (Joe Elliott (vocals), Vivian Campbell (guitar), Phil Collen (guitar), Rick “Sav” Savage (bass) and Rick Allen (drums). Registration is open now, offering campers the option of purchasing a four day Headliner package or Recording Star package. Both packages include lunch daily, scheduled classes and daily jam sessions, an opening night cocktail reception and a DVD of the final concert performance. To celebrate the camp’s culmination Sun., April 7, campers and counselors will host a live concert. For registration and additional camp information, call 1-888-762-2263 or visit www.rockcamp.com. “I’m beyond thrilled to be producing the Def Leppard Fantasy Camp. I know this is going to be an amazing experience for any Def Leppard fan regardless of musical experience,” said David Fishof, Rock ‘n’ Roll Fantasy Camp founder, veteran music producer and author of Rock Your Business: What You and Your Company Can Learn from the Business of Rock And Roll. In addition to the monthly camps, Rock ‘n’ Roll Fantasy Camp offers the ultimate rock star program, “Rock Star for A Day.” Locals and visitors alike can participate in a two- or three-hour jam session with famous musicians. The package includes everything necessary to provide the full “Rock Star Experience.” Rock ‘n’ Roll Fantasy Camp also offers Corporate Team Building experiences sure to rock any business.